(186 x 254) 11 x 14 in. A3 Size 10 x 13.7 in. (254 x 348 mm) 11.7 x 16.5 in. Yeshe Tsogyal (circa 757 to 817-837), meaning the ‘Wisdom Lake Queen’, was the foremost Tibetan disciple of Guru Rinpoche (Padmasambhava), and the most important of his five main consorts. She is regarded as a manifestation of the goddesses Sarasvati, Vajravarahi, Locana, and Tara, who would later incarnate as Machig Labdron (1055-1149). The level of Yeshe Tsogyal's final realization was considered to be equal to that of Guru Rinpoche himself. She was auspiciously born as a princess of the Karchen clan in Central Tibet, and immediately after her painless birth the sacred lake (Tib. tso) that forms part of her name miraculously sprang forth close to where she was born. Like Sarasvati, the goddess of wisdom and knowledge, she developed great intelligence and a phenomenal memory by the age of ten, and would later have complete recall of all the oral transmissions and teachings she received throughout her life. However, her early life as a teenager was traumatic, until the Buddhist King Trisong Detsen took her as his wife and consort. The after having received Tantric initiation from Guru Rinpoche the king then bestowed this beautiful sixteen-year-old girl to his guru as his a 'mandala offering'. Yeshe Tsogyal specialized in the practice of the wrathful yidam-deity Vajrakilaya, the transmission of which she received from her ‘precious guru’ (Guru Rinpoche), along with many of his other profound teachings. Under his instruction she later traveled to Nepal and became the spiritual consort of a yogin named Atsara Sahle, with whom she practiced in remote caves. It was during their long retreat together at the mountain hermitage of Paro Taktsang in Bhutan that Yeshe Tsogyal attained the initial stages of her enlightenment. After many years of austerities and intense practice Yeshe Tsogyal then returned to Tibet, and traveled with Guru Rinpoche to countless sacred places throughout the Tibetan and the Himalayan region. Together they bestowed teachings and transmissions, subdued negative forces, and consecrated hundreds of caves, mountains, temples and sacred sites with their blessings. At many of these places they concealed specific teachings and empowered objects to serve as terma or ‘concealed treasures’ that would later be revealed by the future incarnations of their most accomplished disciples. Throughout the centuries many of these ‘treasure-finders’ or tertons have since recovered hundreds of these terma treasures that were hidden in rocks, caves, earth, lakes, the sky, and likewise through pure vision or direct mind transmission. Around the age of forty-two Yeshe Tsogyal went into solitary retreat for nine years, emerging as a fully enlightened Buddha. But by this time Guru Rinpoche had already left the land of Tibet for the luminous dimension or Pure Land of his ‘Copper Colored Mountain’. Yeshe Tsogyal probably lived on and taught in Tibet for about another thirty years, during which time she compiled her own life story and several profound biographies of Guru Rinpoche in varying lengths, which she concealed as termas. Finally she ascended from this world in bodily form to abide with her Precious Guru in the paradise realm of his Copper Colored Mountain. I came upon this representational form of Yeshe Tsogyal in Lhasa in 1988, when I helped to clean the original wall paintings in the Lukhang Temple behind the Potala, which were painted during the short lifetime of the Sixth Dalai Lama. Later I redrew her in this form from a slide-photo taken at the Lukhang, changing the cave and its landscape to accord with my own artistic style. Some years later my friend Marc Baudin had this and many other drawings of mine made into paintings by two of the most skillful Indian miniature painters, who were instructed by Marc and myself at his studio in Jaipur. Executed in pure mineral pigments, this painting depicts Yeshe Tsogyal as a human manifestation of Vajrayogini, who kneels upon her moon disc and lotus holding the 'curved-knife of a dakini and a skull-cup full of blood. 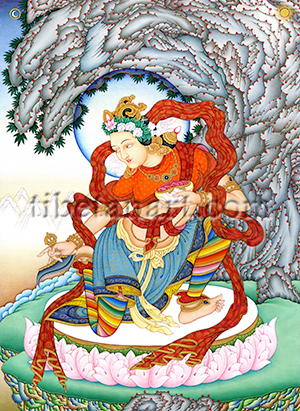 These dakini attributes respectively represent her ability to sever all delusions and cultivate great bliss. She wears golden ornaments, a floral tiara, upper and lower garments of multicolored silks, and the rainbow trousers that enlightened dakas or dakinis traditionally wear.